Finely chopped parsley, tomatoes, onions, cracked wheat, lemon juice & olive oil. Charbroiled eggplant blended w/ olive oil, seasoning & garlic. Chickpeas blended w/ fresh lemon juice, olive oil, garlic & tahini (sesame sauce). 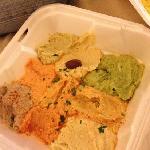 Try all of the hummus in the house. 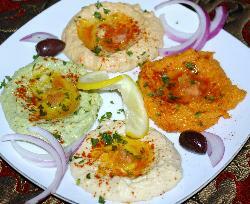 A sample of each of our gourmet hummus. Sorry, no substitutions. Yogurt, sliced cucumber & spices. Grape leaves stuffed w/ rice, pine nuts, currants, herbs & spices. Zucchini, cheese, eggs, green onions. Lightly Fried. Choice of vegetables, meat, chicken, or feta & spinach wrapped in phyllo dough lightly fried. Chickpeas blended w/ seasoning & deep fried. Served w/ tahini (sesame sauce). 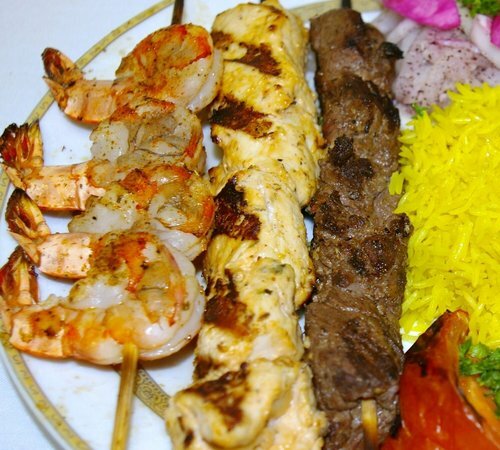 Choose two kabobs from the following options: marinated beef, kafta, or marinated chicken breast. 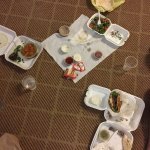 Choose three kabobs from the following options: marinated beef, kafta, spiced lamb, or marinated chicken breast. Our take on classic shawarma. Choice of 2 lb. seasoned beef or chicken marinated in traditional seasonings, thinly sliced then sautaeed. 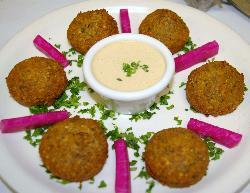 Served w/ tahini sauce. Half of a roasted chicken marinated w/ Mediterranean seasoning & slowly roasted. Chicken breast,‏ imported Feta, tomato, kalamata olives, red onions, & greek dressing. Short loin lamb chops marinated in fresh garlic, lemon juice, cilantro, herb seasoning & grilled. Tilapia fillet wrapped in grape leaves, grilled leaving the fillet flavorful & tender. A whole roasted chicken w/ 2 serving of salad, rice & hummus. Marinated chicken breast skewered & charbroiled. Marinated boneless lamb skewered & charbroiled. Seasoned shrimp skewered & grilled. Marinated tender beef skewered & charbroiled. Marinated, ground mixture of lamb & beef skewered & charbroiled. kabob skewers (Choice of kafta, beef, lamb or chicken). 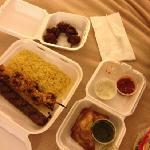 One roasted chicken & kabob skewers(4) (Choice of kafta, beef, lamb or chicken). Kabob skewers(12) (Choice of kafta, beef, lamb or chicken). Our fried chicken is cooked in a broaster which is pressurized, leaving the chicken very juicy. Any order of broasted chicken requires advance ordering, at least 30 minutes. Phyllo dough layered w/ pistachios, walnuts, & butter. Topped w/ honey. A variety of Ice Cream. Ask your server for todays selection. 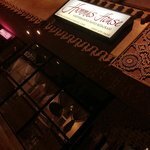 Ask us about our specialty desserts. 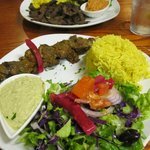 Choice of beef, lamb, kafta, chicken. Petit resto proche de notre hôtel, cuisine épicée de type turc. Des progrès à faire niveau déco mais raisonnable pour un repas rapide. La nourriture est très bonne. Le service était excellent. Les serveurs étaient au-dessus et au-delà. Je definality je reviendrai. J'ai séjourné dans ce restaurant 4 fois - nous n'avons jamais été déçus. Nourriture délicieuse, et les prix sont très raisonnables. Super service, les gens sont super ! L'atmosphère était calme et reposante. Le service était excellent, très attentionné, et la nourriture était fantastique. Obtenez des réponses rapides du personnel et personnes ayant visité le Hummus House.